Vitello Tonnato is a staple of Northern Italian culinary tradition. Very likely, it appeared on the tables of Italy at the end of the 18th century and more than one region claim to be the fatherland of this delicious dish, Piedmont, Lombardy, Emilia Romagna and Veneto above all others. As a Piedmontese, I of course consider Vitello Tonnato piedmontese, but I will not get offended if you see it differently! 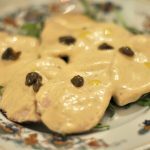 The first, written recipe for Vitello Tonnato was the one presented by Pellegrino Artusi in his La Scienza in Cucina e l’Arte di Mangiar Bene, published for the first time in 1881. But if I told you there is one, single recipe for Vitello Tonnato, I would be lying. First of all, there are a cold and a hot version of it, but here we will only present the cold version, which is by far the more popular. Thing is, cold Vitello Tonnato is not always made the same way. In my family, for instance, the sauce has always been mayonnaise-based, as it was this way my grandmothers made it. Basically, you would add the blended tuna, capers and anchovies to a base of homemade mayonnaise: yes, homemade. There was no way my grandmothers would have bought mayonnaise from a store. This version of the sauce is at least one century old, so it could well be considered “traditional,” yet, there is an even older version of it, which does not involve the use of mayonnaise. The binders for all the ingredients are boiled egg yolks and olive oil, to which, once again, tuna, capers and anchovies are added. Both sauces are delicious and delicate, with a lovely punch given by the anchovies. Below, we propose the recipe for both sauces. The mayonnaise based sauce is delicious on fresh bread or as a substitute for simple mayonnaise in a meat sandwich. To have a truly delicious “salsa tonnata” with mayo, you should really use homemade mayonnaise, as it makes an enormous difference in taste and texture. When it comes to the meat, the piece usually chosen is the “girello,” or eye round in English: needless to say, the meat has to be of the best quality, if you truly want to enjoy Vitello Tonnato at its best. Place the eye round in a large bowl and marinate it for a full day with the white wine, the chopped carrot and celery stalk, the bay leaves and sage. Once the marinating time has passed, move the veal into a saucepan deep enough to hold the meat, the filtered marinade and enough water to entirely cover the meat itself. Cook the eye round on low fire for one to two hours, until the cooking broth will reduce to about 1/2 litre of liquid. Remove the meat from the pan, let it cool and slice it very thinly. Place the boiled egg yolks, anchovies and the tuna drained of its oil in a mixer. Mix well, until it gets creamy, then add the capers, the vinegar, the lemon juice and the 1/2 glass of olive oil. Stir well, until the sauce is homogeneous and add some of the meat's cooking broth if you find it too dry. its consistency should be that of homemade mayonnaise: creamy, yet not runny. Spread over the thinly sliced veal and let cool in the fridge for an hour before serving, to let all the flavors combine with one another. 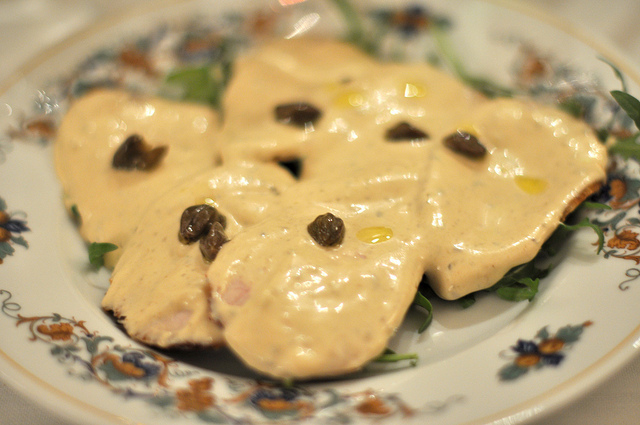 As we said above, Vitello Tonnato is a traditional recipe, which has been changed and modified throughout the decades. If the cooking method for the veal remains very much the same, differences are easily encountered when it comes to the sauce. The most common alternative to the traditional sauce, which is made with a base of boiled egg yolks, is that made with mayonnaise instead. In a mixer, blend together the tuna, the capers and the anchovies. If the mixture is too dry, you can add a tablespoon or two of the veal's cooking broth. Once it is smooth, add 250 gr of mayonnaise and mix well with a spoon. Voilà: your mayo based salsa tonnata is ready. Ideally, you should prepare the mayonnaise yourself, as nothing tastes as good as homemade mayo! In alternative, make sure to pick high quality mayonnaise from the store, as a bad mayo could ruin the final result! Vitello Tonnato is lovely served with fresh white wines like Arneis. It is usually considered a starter, but many, especially in the Summer, like to have it as a main dish. Make sure to have good, fresh bread: the "salsa tonnata" is to die for with it!